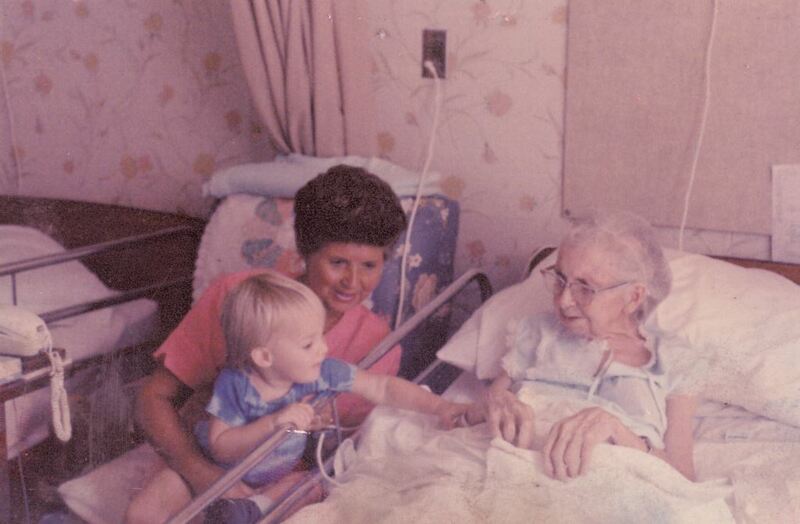 Mary Alice Powell Aulin (1904-1993) at the Winter Park Hospital in Winter Park, Florida, as she is being visited by her daughter, Bettye Jean Aulin Reagan (1923-), and her great grandson, James Phelps Richardson (1987-). Alice Aulin was born in Sanford, Florida, to parents Charles Powell and Mary Maude Rabun Powell. Aulin arrived in Oviedo in 1921 to work as a switchboard operator and a seamstress. She married Andrew Aulin, Jr. (1893-1964), the son of Oviedo's first postmaster, Andrew Aulin, Sr. (1843-1918). Together, the couple had five children: Mary Lenora Aulin (b. 1924), Alice Kathryn Aulin (b. 1926), Charles Warren Aulin (1927-1964), Bettye Jean Aulin, and Andrew Aulin, Jr. (b. 1936). Richardson was the son of Reagan's daughter, Julie Karin Reagan (1959-), and Barry Phelps Richardson (1953-). Original color photograph: Private Collection of Bettye Reagan. "Need No Title by Bettye Reagan." RICHES of Central Florida. https://richesmi.cah.ucf.edu/omeka2/items/show/6955. 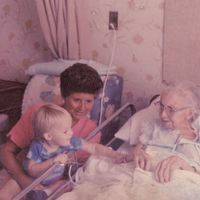 “Bettye Jean Aulin Reagan and James Phelps Richardson Visiting Mary Alice Powell Aulin at the Winter Park Hospital.” RICHES of Central Florida accessed April 21, 2019, https://richesmi.cah.ucf.edu/omeka/items/show/6954.